Can you help us to identify the man in this picture? 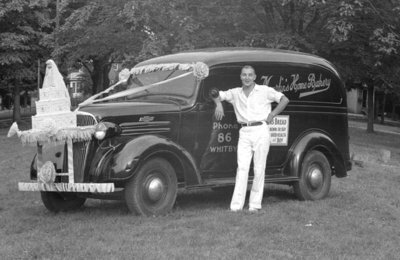 Black and white negative showing the delivery truck for Martin's Home Bakery. There is what appears to be a model wedding cake mounted on the front of the truck. The man standing beside the truck is unidentified. Martin's Home Bakery Truck, August 4, 1939, Marjorie Ruddy. Whitby Archives A2014_040_760A.